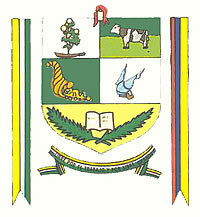 Translated from <www.turismoguayas.com> (defunct): "It consists of three horizontal strips: yellow, green and white." Image of the flag at <www.guayas.gov.ec>. I have draw this flag and have taken the cloth to an uniform ratio of 1:2. Canton established 19 July 1984.